Adventures in Motoring: A catch up! Well, it appears that one thing quicker than Ms Skyline is time. I can't believe that we are rapidly approaching the end of the year. Mind you 'time' itself in terms of a 24 hour day, is an abstract concept I suppose and with my main turbo pipes at the polishers it seems to be taking 'forever' to get them back! So pockets empty of cash and the economic climate also empty of cheer. We can all amuse our selves of the fact that Christmas rapidly does approach! So to the car.. It has not sat idly by lately (as if I could stop tinkering). After completing the paint work on the slam panel and whilst the car is laid up STILL waiting for the pipework. I have indulged myself with some other works cosmetically enhancing her already good looks. With this in mind I took a deep breath and started to work on the front splitter. This will be it's third clean up in a year so far (will get to that). Although the last time it was sprayed it was a rush job of a not very high standard. This time around I was determined to take my time and get it right! Will not bore you with the photo's, although the finish is to a very high standard. To protect it from the dreaded stone chips I plan to vinyl coat it. Not decided on quite how yet, or if it is a job for me, or for someone that actually knows what they are doing. I also removed the front Spec 2 Grill. 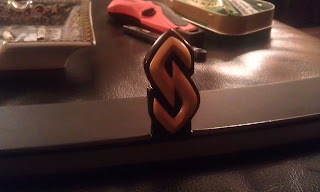 Even though previously I had made do and mended, I was not 100% happy with the actual finish. I decided to 'man up' and completely strip the layers of previous owners paint back to the plastic and do a 'real' job of it. I can confirm that I must be it's third owner as my black coat of paint when removed revealed another black coat of paint and finally a gunmetal layer of paint. The hard part about getting the paint off was really getting it out of the tight corners and I spent most of a day with a set of small needle files picking paint out. Finally I was ready to paint and ironically I used a filler primer to smooth out the finish of the plastic. I was so pleased with the results, I then turned my attention to the actual wire mesh of the grill itself. As you can also see below the 'S' logo was also worked on pretty heavily. It isn't perfect where the previous owner was an idiot. However it passes my high standards! This is of an all in one design, consisting of a frame, with mesh attached. As the top of the frame actually is on show when the bonnet is closed, it was pretty important to keep this. The wire mesh is made of steel and is quite strong, also being (for mesh) quite large. 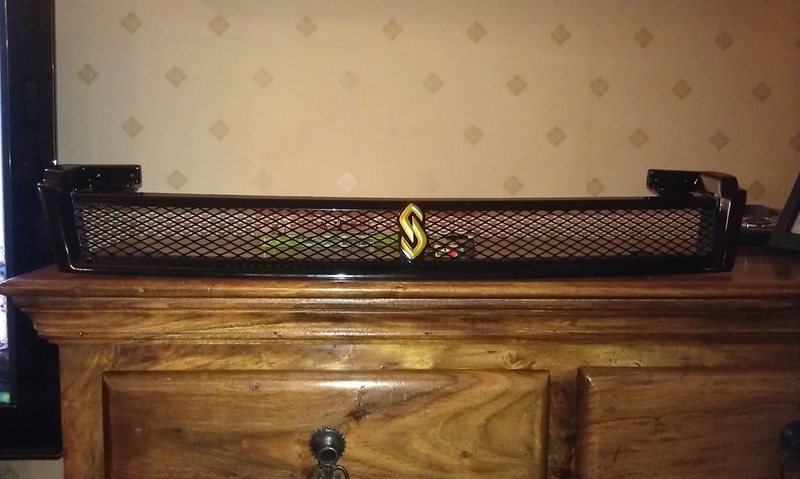 I decided that I could use some Ripspeed Stretched competition mesh at £24 it wouldn't break the bank etc. This is of Aluminium construction, so rust will not be an issue. It is also quite thin, so cutting it to size would be easy. With the old grill I chopped out the old mesh with some tin snips. The mesh is actually spot welded to its top frame making this a one way only deal, so it was just a bit scary. I then just counted up the 'holes' in the mesh and cut out a long strip of mesh. I did think about being scientific about cutting the angled ends etc. But in the end I simply held my strip along side the grill and 'chopped away' with a steady hand. Okay so the first attempt was crap! However the second was spot on and happily you get quite a bit of mesh to play with. I did leave some of the old mesh (where it was spot welded) in the top of the frame, straightened it out and then after fitting the new mesh, bent this back to hold the new mesh in place. I secured the lower part of the mesh in place with body kit glue (just a bit!). In some strange way cutting the mesh was an enjoyable task, each length requiring two snips per 'mesh hole'. There's a fair bit more I have been working at and I will be updating as I catch up!